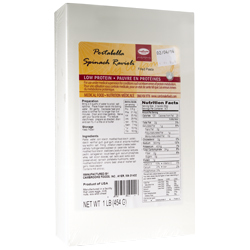 Description: Each package contains 1 lb (~33) of fresh-filled, precooked Ravioli. Our Portabella Spinach Ravioli are small pouches of fresh pasta dough filled with a low protein savory cheese with herb blend, spinach and portabella mushrooms. We use only fresh spinach and portabellas from local farms and flame roast them in our facility. Our special dough and filling is prepared fresh, par cooked, and frozen rapidly to keep all the flavor in! You'll appreciate the gourmet taste in every bite! Our Ravioli can be boiled, sauteed, or deep fried for many wonderful serving variations. Add your favorite homemade tomato sauce, gravy or just plain with butter to complete the presentation! Microwave oven: Place frozen ravioli in microwavable dish. Completely cover ravioli with your favorite sauce or gravy. Cover dish with plastic wrap. Heat on high for 30 seconds per ravioli. Let stand covered for 5 minutes before serving. Serving Suggestions: Serve simply with olive oil (or butter) and a sprinkling of Cambrooke Foods Chicken-Flavored Consomme and Seasoning and cracked black pepper or your favorite sauce, gravy, or with sauteed vegetables folded through for a fabulous gourmet meal. Drop ravioli into boiling Chicken-Flavored Consomme and Seasoning for an awesome quick meal. Ingredients: Pasta: water, cornstarch, modified food starch, potato starch, xanthan gum, guar gum, olive oil, enzyme-modified soy lecithin, salt. Filling: imitation cream cheese (water, partially hydrogenated soybean oil,caseinate, lactose, modified food starch, stabilizers [sodium stearoyl lactylate, pectin, carrageenan, locust bean gum, sodium phosphate, whey, salt, silicon dioxide], salt lactic acid, sorbic acid [preservative]), spinach, portabella mushrooms, water, modified food starch, onion, basil, olive oil, kosher salt, garlic, black pepper. Contains milk and soy.